Securious have carried out new research which has revealed that fewer than 5% of the region’s largest businesses have achieved Cyber Essentials, the minimum level of cyber security compliance set out by the Government. Created to help businesses demonstrate that they have technical and organisational controls in place to defend against the most common and unsophisticated forms of cyber-attack, Cyber Essentials also helps businesses meet their GDPR requirements. It enables businesses to demonstrate that they have frameworks in place to protect the integrity and confidentiality of data through use of appropriate security and protocols for processing data. Securious, which became the first company in the South West to qualify as a certification body for the Government’s Cyber Essentials programme, believes that companies without Cyber Essentials or higher levels of accreditation, run the risk of becoming uncompetitive as well as possible victims of cyber crime. 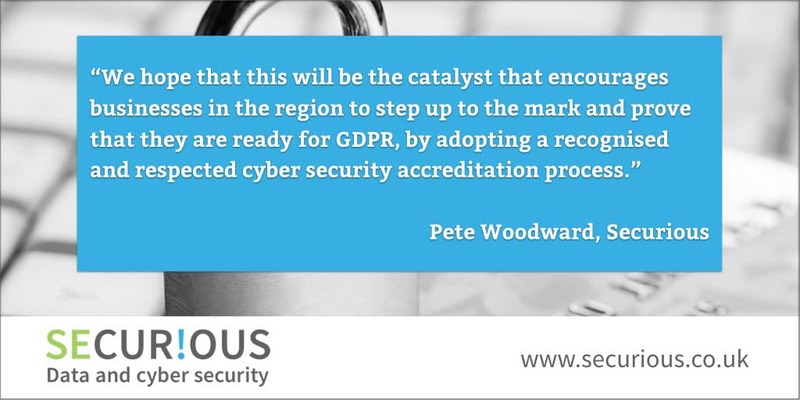 Pete Woodward, founder of Securious, commented: “Our research shows that out of the region’s top 150 companies, fewer than 5% have adopted the Government’s Cyber Essentials accreditation process. “Cyber security certification is required by an increasing number of Government departments, local authorities, large companies and organisations. Businesses failing to adopt compliance, be that through the adoption of Cyber Essentials or ISO 27001:2013, are therefore putting themselves at a significant commercial disadvantage. They also run the risk of attacks from viruses such as WannaCry and the ransomware virus, Petya, which had disastrous implications for companies across Europe, the Middle East and the US, only last year. Despite the low level of compliance by many of the South West’s largest businesses, Securious has seen the number of businesses achieving Cyber Essentials with them rise by 200% between 2016 to 2017. “We’re seeing growing numbers of businesses taking cyber security seriously. GDPR has undoubtedly focussed minds, but this shouldn’t be a simple box ticking exercise. Businesses need to be aware of how damaging a data breach can be, not only for their customers, but also for the integrity and long-term commercial viability of any business that fails to put proper cyber security and data protection in place. “It’s a matter that affects businesses of all sizes. It’s a continuous process that requires constant vigilance and regular reassessment. Cyber Essentials provides an entry level of accreditation that enables business to be sure that they have a base level of security in place to defend against up to 80% of common internet attacks. It helps businesses meet GDPR Principle 6; integrity and confidentiality, ensuring appropriate security, and article 32; security of processing. Cyber Essentials Plus takes this up a level, giving businesses assurance that they have cyber security controls in place to protect themselves against the most common internet-based cyber threats. Critically, it includes internal and external vulnerability scans helping businesses to protect themselves against the latest threats, and to remain compliant. Businesses that achieve this level of accreditation not only improve their cyber security resilience, but are able to openly show clients, prospects and partners that they have suitable measures in place that are also recognised and rewarded by the insurance industry through preferential premiums. Bideford Half Marathon - Roz on the run!